High quality, aesthetically pleasing faucet made of solid, brushed stainless steel. The single lever kitchen tap is constructed in solid stainless steel. 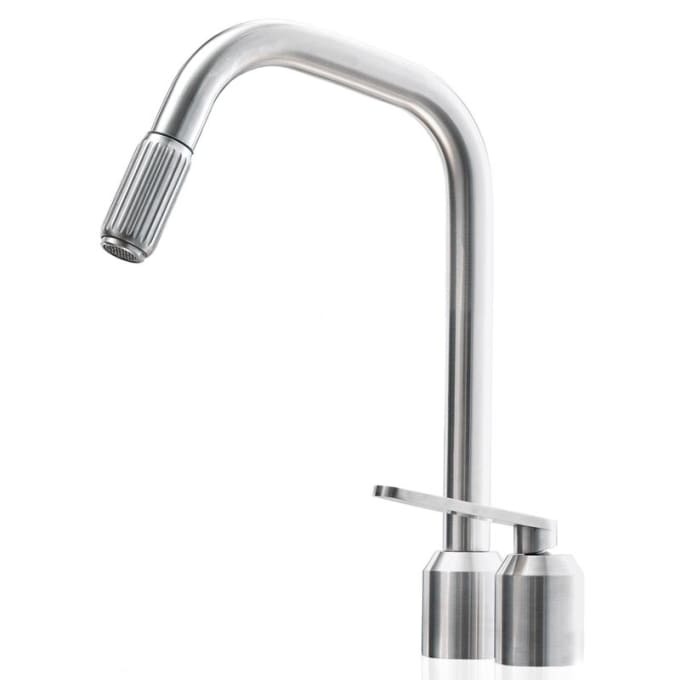 The tap is equipped with a swivel spout and a pull out spray. Of technical subtleties are the lime resistant aerator and the ceramic cartridge worth mentioning, which with a minimum of maintenance leads to a drip-free tap and a soft water jet. “Our starting point was to create a set of highly functional, high-quality taps with a simple design that would match most kitchens and bathrooms and, of course, Vipp’s own kitchen and bathroom modules,” says Vipp’s Senior Designer Morten Bo Jensen. Keep stainless steel clean and dry. Stainless steel may be permanently stained if water / fat / cleaning products are not removed relatively quickly. We recommend the use of a care product for stainless steel, to make the surface water and dirt repellent. This makes the daily cleaning with a damp lint-free cleaning cloth a lot easier. If the above instructions are followed, the stainless steel surface remains beautiful for many years. Remember not to use chlorine / abrasive cleaners as this may damage the surface. Lime stains on stainless steel can be removed with warm soapy water, a soft sponge and a lot of elbow grease. It is important only to use a soft sponge, or else you may damage the brushed structure of the steel surface. For grease stains use alcohol or glass cleaner. Do you have a question about "Vipp 901"? How can we contact you?